Dating from the 8th century AD, the Moylough belt shrine is one of the great treasures of early Ireland. Fashioned out of bronze and silver, it was found in 1945 by Mr John Towey as he dug turf on his father’s farm at Moylough, Co. Sligo. Slicing through the soft peat, he unexpectedly hit something hard at depth of c. 4 feet below the surface. Presuming it was a large stone, John bent down and cleared away the soil with a small garden trowel. To his amazement, what was revealed was not a stone, but instead, a glistening, metallic object. The Moylough belt shrine had been discovered. The belt consists of four bonze segments, each of which enclose a strip of plain leather. The bronze sections are richly decorated and are also hinged together, so that the components are flexible. This means that the belt could, if desired, be placed around the waist. Indeed, wear patterns visible on its surface suggest that it was often worn/used. Each of the bronze segments contain a centrally placed medallion featuring a ‘Celtic cross’, while their ends are further ornamented with panels of stamped silver foil or openwork bronze. 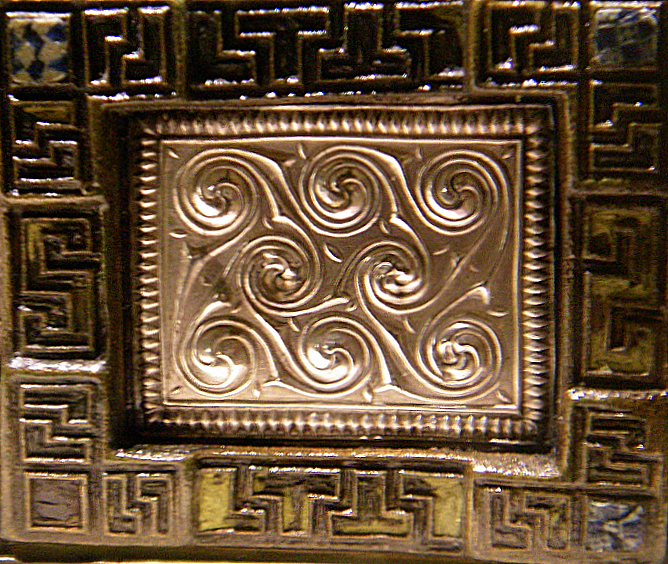 The most elaborate decoration is seen on the two front segments, which take the form of a false buckle and buckle plate. These are embellished with silver foil, glass and enamel, as well as animal and bird head motifs. This beautiful artefact more than likely represents a shrine that was specifically made to encase the leather segments. It is these simple leather strips then, and not the costly casing, that are the real treasure[i]. They were probably associated with a local saint and must have been important relics to have been so richly adorned. Although this is the only belt shrine to survive, a number of sacred belts are mentioned in Life’s of the Saints[ii] and these objects were often imbued with mystical powers. For example, the girdle/belt of St. Bridget was reputed to cure any illness or sickness. Similarly, the girdle/belt of St. Cronan was used to cure the King of Munster after he was afflicted by a terrible ailment. The belts could also have more formal uses. 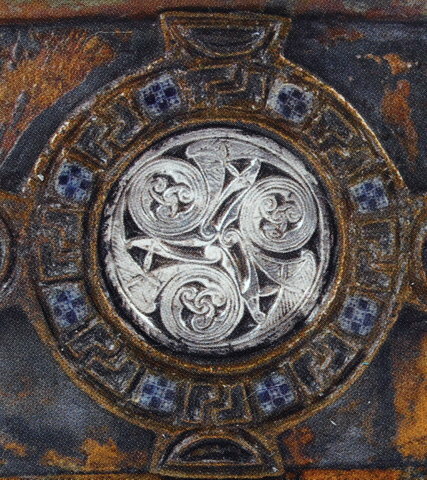 The sacred belt of St. Mobhi , for instance, never ‘closed around lies’, suggesting that it, like many other Irish relics, was used in oath swearing ceremonies[iii]. It is likely that the Moylough belt shrine was used in similar rituals to effect cures or establish truthfulness[iv]. Indeed, this probably explains why the belt contains extensive evidence for wear around its hinges and buckle. It appears that it was often taken on and off, probably during specific ceremonies. The belt now resides in the National Museum of Ireland, Kildare Street, Dublin, where it can viewed free of charge. I cannot get beyond calling that a ‘belt’ being wrong. And not just wrong but very wrong regardless what Duignan said. Yes I think he’s correct that the metal is the surround to the bits of leather. But the Derrynaflan has an object that’s called a patten stand which is it’s twin but for the links. And since the we’ve been calling it a belt we’ve been bending it. Who’s to say the object isn’t a collapsible ‘square’ patten stand. Mind you I think that patten notion with it’s stand is a bit thin also. I guess I find the thought of a “scared belt” somewhat humorous. Might I suggest a typo correction at this point?